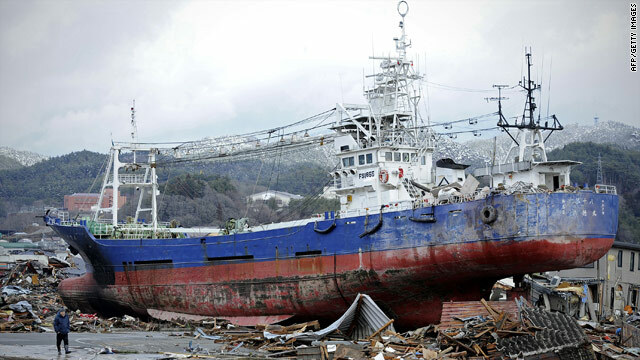 A ship is left aground in Kesennuma in Japan's Miyagi Prefecture after Friday's earthquake and tsunami. Sophisticated recording equipment on the floor of the Pacific Ocean recorded the sound of the earthquake that hit Japan on Friday, as well as two aftershocks. Spain's Polytechnic University of Catalonia, through its Laboratory of Applied Bioacoustics, made the recordings. The low-frequency sounds had to be accelerated by a factor of 16 to make them audible to humans, the lab's website says. why don't use these firefighter ships to send a continuous flow of water atop of the Fukushima's nuclear plant buildings? So humans couldn't hear it underwater. I experienced the 1989 los gatos boomer and the explosive sound was pretty impressive. Not quite like standing next to a tank firing but close. Interesting that the water muffled the sound to where it was inaudible. I didn't think that would be the case. So people say earthquakes happen all the time which is true. So the world can't end cause of earth quakes. But here's to the ignorant experts that don't believe in the word " well since earth quakes and tsunamis are common which I agree, can you explain nuclear meltdowns which are manmade and will probably kill many people with it's strong radiation. So all you people that think 2012 is a myth you better rethink and get to safety before sh!t really hits the fan. Hope there are no nuclear plants anywhere close to the US west coast or near yellowstone! Well good luck and farewell , just saying! Oh Man -they just built a nuke over "Old Faithful". Darn! yes there are many nuclear power plants in the west coast. you will not be safe anywhere. Please stop with the God comments, since there is no such thing as God! I've asked for my forgiveness from God and I suggest you do the same! Also I can't wait to meet God hopefully he hooks me up with a nice girl lol jk about that but this nuclear meltdown does not look good. Could it hit the fan and cause the apocalypse? Probably because it's unnatural event. Just like the oil spill made all those birds and fish die this radiation could kill us. Life is good but when I die I hope it will be better! The only eternal life is through being eaten by worms and microbes. You just restart at the bottom of the food chain and then spread all through that chain. Maybe nutrients in your body will go through many forms of flora and fauna and end up in a Big Mac. I would rather end up in a Falafel or Greek Salad. how do you know that the oilspill killed the birds?? ?There was birds dying BEFORE the oilspill..and about god...Sorry but there is no god!!! There is a free app called GEE (Global Earthquake Explorer) that is well worth checking out. Sooo..., where was your God when this happened, or did "he" do it on purpose, which would be....what, why? I experienced a Richter magnitude-5.5 earthquake one afternoon in 1955 at the city library of Mount Vernon, Washington when I was ten years old, complete with jackhammer compression P-waves followed by rocking shear S-waves for about 30 seconds. The sound that quake made is still the strangest sound I have ever heard in my life. While I rocked back-and-forth in my chair inside the library, I heard a fairly-loud mechanical humming noise like an enormous electric dynamo spinning deep inside the earth below my feet. The sound completely surrounded me from all directions down, up and sideways like the most complete surround-sound experience you could ever imagine. It is still one of the most vivid memories of my life. One aftershock, but little damage resulted, one toppled chimney reported in the Mount Vernon Herald. Are we as humans doomed to repeat the same mistakes and to deny GOD existance. The earth has wipe its self clear in more ways then one and Ive humble myself at the force of it I know Im only human and to appreciate my existance. We didnt make the earth we need to remember that. When GOD says enough I'm sure we'll all know.no one is perfect so guess what the world will start anew. People that does not believe in God are invisible and do not exist.